Bringing industry directly to the classroom is the only way to ensure the skills required by employers are being offered to students. Andrew Sezonov, General Manager of the Skilling Australia Foundation, told a meeting of the Northern Adelaide P-TECH Partnership Steering Committee, more needs to be done across Australia to ensure students graduating from high school, TAFEs and tertiary institutions have the skills that match employers’ needs. Mr Sezonov was in Adelaide today to chair the final steering committee meeting for 2018. 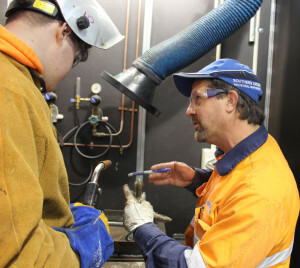 St Patrick’s Technical College, in Edinburgh North, was one of 14 sites across Australia to pilot the innovative P-TECH model in a bid to better align student outcomes with employer demands. 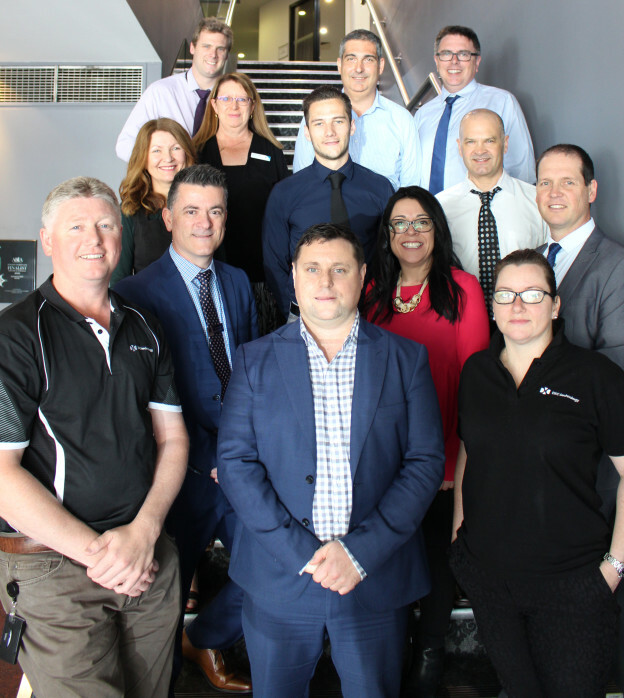 Today’s meeting involved representatives from St Patrick’s Technical College, Catholic Education South Australia, TAFE SA, the Federal Department of Education, Defence Teaming Centre, Saab Australia, Century Engineering, PMB Defence and DXC Technology. “The Northern Adelaide P-TECH Partnership has excelled the benchmark in terms of collaboration and establishing true industry partnerships,’’ Mr Sezonov said. The meeting also saw Mr Sezonov hand over the reigns as chairman for the Northern Adelaide P-TECH Partnership to StPatsTech STEM Faculty Manager Brad Sheridan. 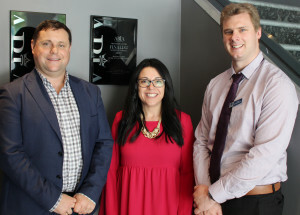 Skilling Australia Foundation Chair Andrew Sezonov with Northern Adelaide P-TECH Partnerships Industry Liaison Officer Toni Hartley and incoming of the Northern Adelaide P-TECH Partnership Steering Committee Brad Sheridan. Mr Sheridan is the Head STEM teacher at St Patrick’s Technical College. Mr Sheridan said the partners were looking forward to continuing the P-TECH Partnership in 2019 and providing students with strong industry connections with Century Engineering, PMB Defence, Saab Australia and DXC Technology. 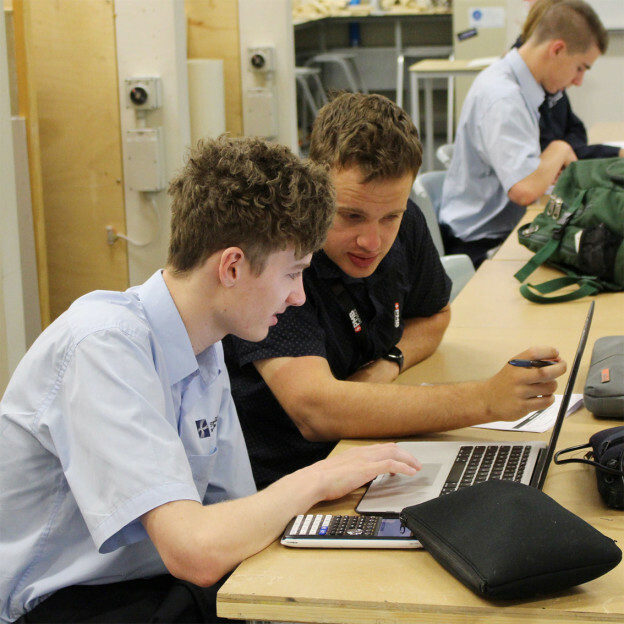 The StPatsTech P-TECH Australia model is offered in Electrotechnology, Information Technology and Engineering. This entry was posted in Industry Office, Latest News on 26/11/2018 by St Patrick's Technical College. St Patrick’s Technical College this week celebrated its 200th apprenticeship commencement in the Building and Construction industry. Year 11 Construction student Lainie Thomson this week signed an apprenticeship with Career Employment Group for a Certificate III in Carpentry and will be hosted by a local builder. StPatsTech shared the celebration this morning with South Australian Minister for Industry and Skills, the Honourable David Pisoni, who visited the Edinburgh North College to meet Principal Danny Deptula and Catholic Education South Australia (CESA) leaders. “Lainie’s signing recently means we are edging closer to our 900th apprenticeship or traineeship commencement,’’ Mr Deptula said. During his visit to the College, Mr Pisoni met with students and staff and toured the $15 million purpose-built facility. 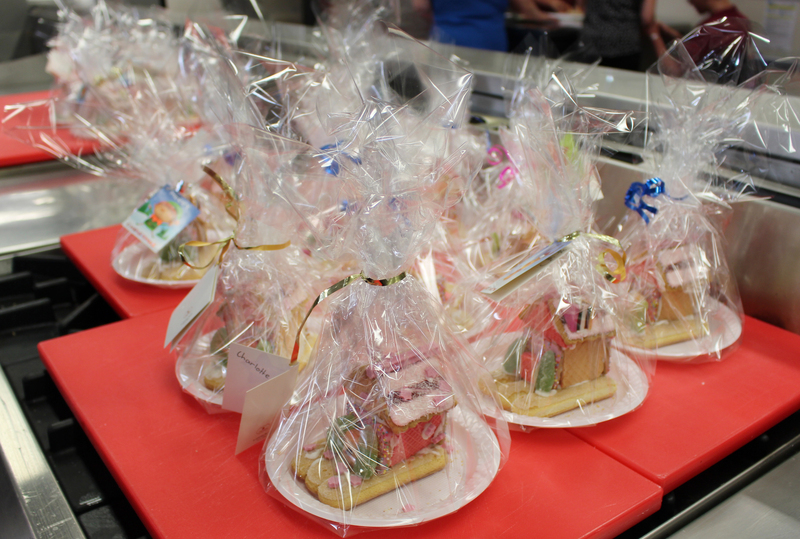 In the past year the College has signed 86 Year 11 and 12 students onto an apprenticeship or traineeship. Over the next 12 months the College forecasts at least 80 more apprenticeship or traineeship commencements and is on track to sign South Australia’s first digital trainee. 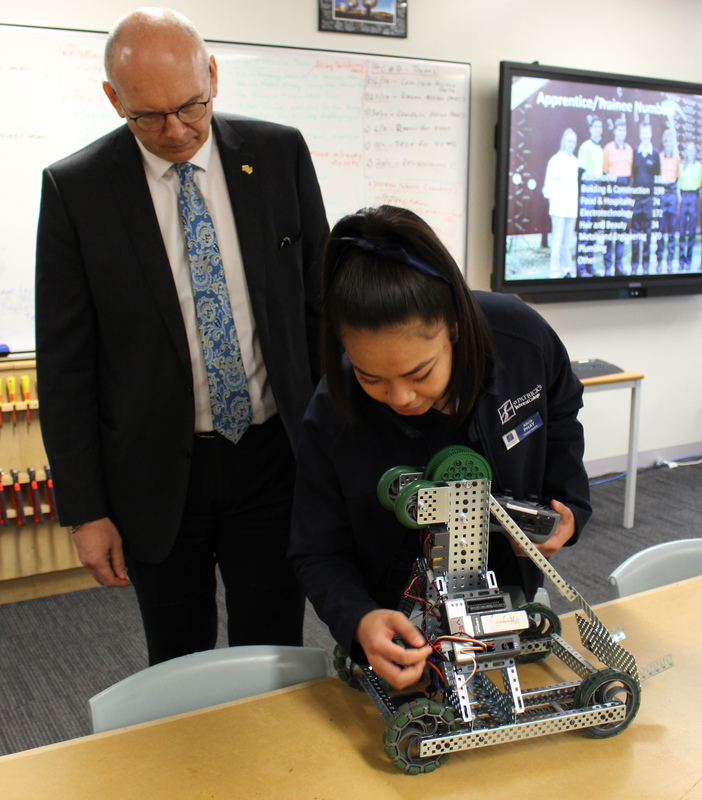 During the visit, Minister Pisoni was able to meet students undertaking the College’s inaugural Information Technology program and see some of their work including the College’s VEX Robotics program. “We are really ahead of the game with our Information Technology course at StPatsTech. Digital traineeships are the way of the future for industry to ensure a good supply of information systems workers and Vocational Education and Training will play a major role in this emerging workforce,’’ Mr Deptula said. The meeting included Chairman of the SA Commission for Catholic Schools Professor Denis Ralph and CESA Assistant Director Monica Conway. This entry was posted in Industry Office on 31/10/2018 by St Patrick's Technical College. St Patrick’s Technical College celebrated its teaching and training staff today along with Member for Light, the Honourable Tony Piccolo MP. Staff came together this afternoon to thank the College’s teachers and trainers for their commitment, care and guidance they show for our students. College Principal Danny Deptula said StPatsTech was fortunate to have some of the best teachers in the country. “We have wonderful educators and support staff here at StPatsTech who are committed to improving and changing the lives of students at the College,’’ Mr Deptula said. Mr Piccolo signed more than 800 thank you certificates for teachers from schools that service the Light electorate in appreciation of their work. This entry was posted in Latest News on 26/10/2018 by St Patrick's Technical College. St Patrick’s Technical College P-TECH Australia partner PMB Defence stopped by the school today to help students learn more about lead-acid batteries. The College’s Year 11 Electrotechnology class have been learning about lead-acid battery cells and how they charge and discharge. The class have been learning the theory aspects of batteries and voltage before heading to the workshop and making their own battery management systems. StPatsTech STEM coordinator Brad Sheridan said PMB Defence’s mentoring and support gives students a much better understanding of how industry works. “To have the engineers of the Collins-class Submarine batteries here in our classroom, sharing their knowledge and time with our young Electrotechnology students is invaluable,’’ Mr Sheridan said. Mr Sheridan said establishing strong links directly with industry was a cornerstone of StPatsTech’s successful school-based apprenticeship and traineeship program. StPatsTech also runs P-TECH Australia programs in Engineering and Information Technology. Pictured: Peter Branson, Project Engineer with PMB Defence, and Year 11 Electrotechnology student Kai, working through lead-acid battery theory. This entry was posted in Uncategorized on 22/10/2018 by St Patrick's Technical College. 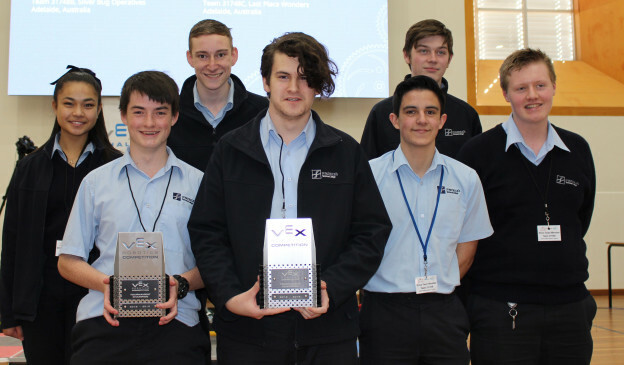 St Patrick’s Technical College students have been crowned the inaugural VEX Robotics champions for South Australia following a series of tournaments this year. 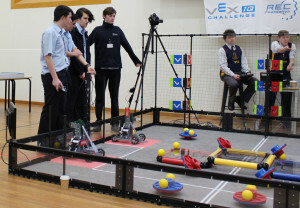 The VEX Robotics VRC Competition was held at Pedare Christian College with schools from around Adelaide entering teams. The competition involves students building and coding VEX Robots to undertake autonomous and directed tasks to earn points. 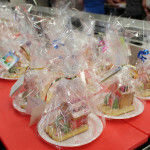 Teams are also judged on their knowledge, teamwork and workbook journals. The win by the StPatsTech two teams – Silver Bugs Operatives and Last Place Wonders – who formed an alliance for the final bout, was even more significant for the College which introduced the Information Technology course in 2018. Sliver Bug Operatives also took out the Judges’ Award for the tournament. STEM teacher Brad Sheridan congratulated the students on their win. “We bought the VEX Robots this year to really give the information technology students hands-on coding and engineering skills and we are extremely proud to see they have taken up the challenge with gusto,’’ Mr Sheridan said. 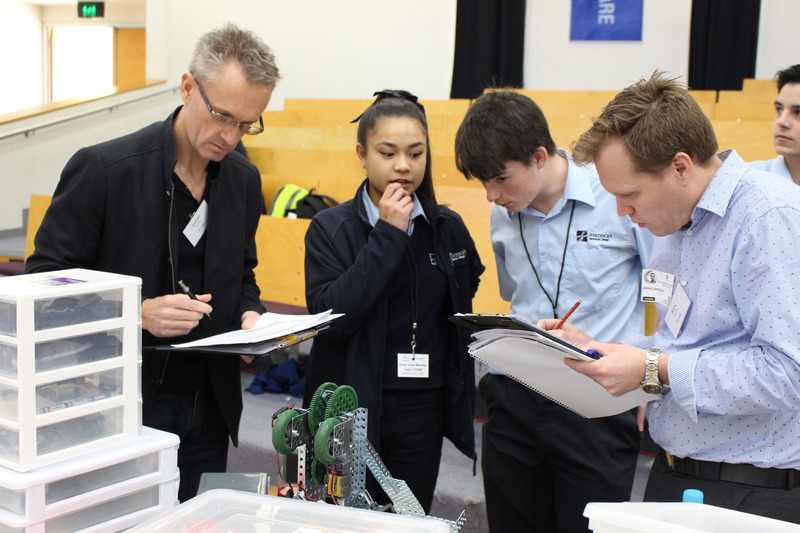 “These students are also fortunate to be part of the P-TECH Australia partnership with Saab Australia and DXC Technology. Through the P-TECH program, the students have been on work experience with both companies and received valuable classroom mentoring from software engineers and programmers within those businesses. Mr Sheridan thanked Pedare Christian College for hosting this year’s competition and said he was impressed to see what other schools are doing with robotics. 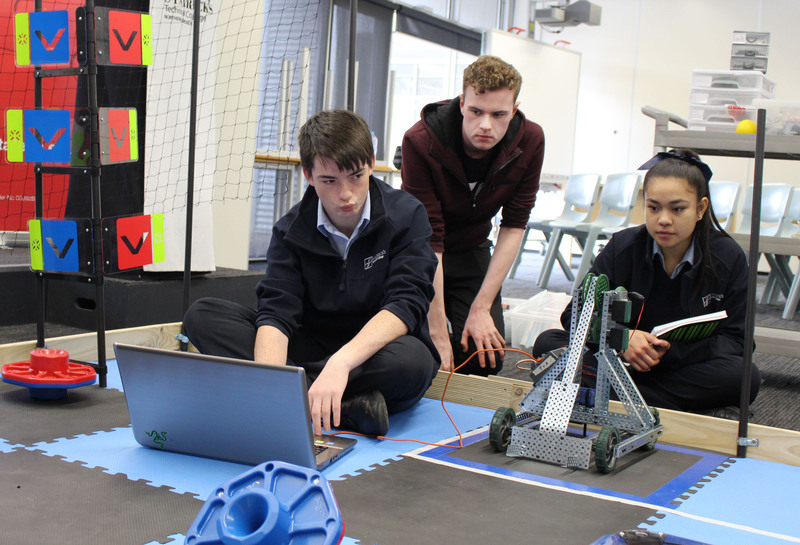 “STEM skills are going to play a huge part in the lives of workers of the future, whether you are going down a university pathway or opting for a trade or technical career,’’ Mr Sheridan said. Enrolments are now open to join the StPatsTech programming course in 2019. This entry was posted in Latest News on 25/09/2018 by St Patrick's Technical College. St Patrick’s Technical College students have been learning from the best recently thanks to the Northern Adelaide P-TECH Australia program. 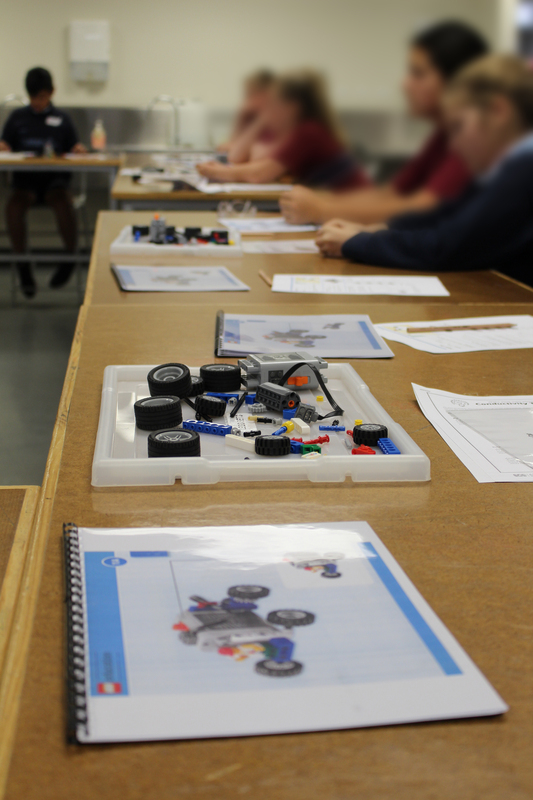 The College is the first in South Australia to run a P-TECH Australia program for its students. It involves industry directly collaborating with teachers and students on projects and providing mentoring and work experience opportunities. 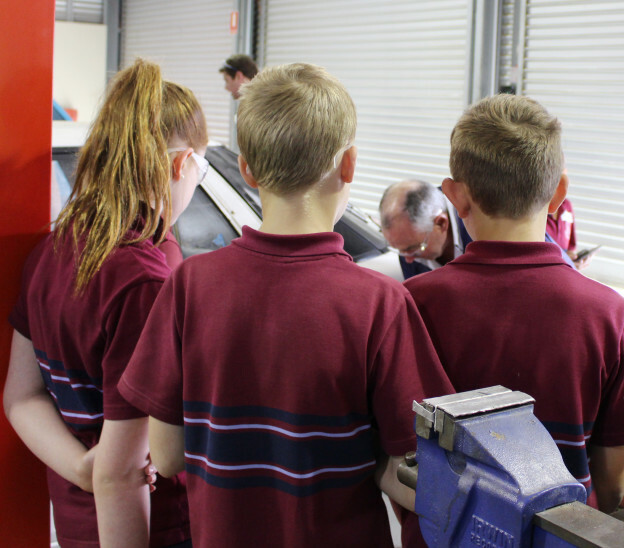 Century Engineering and the newest Northern Adelaide P-TECH partner DXC Technology have spent time in with students during term three. Century Engineering’s John Knop hosted four special welding sessions with students from the Year 11 Metals and Engineering program. Mr Knop, a Certificate 10 Welding Supervisor, showed students how to do a 6 millimetre fillet weld. Students learnt through trial and error how to set welding marks and produce a quality fillet weld. Century Engineering’s Business Development Manager Andrew Sinclair said it was important for the students to understand why certain welds failed and others succeeded and how to properly use the machinery. Meanwhile, students in the College’s Information Technology program received some mentoring from software engineers at DXC Technology. 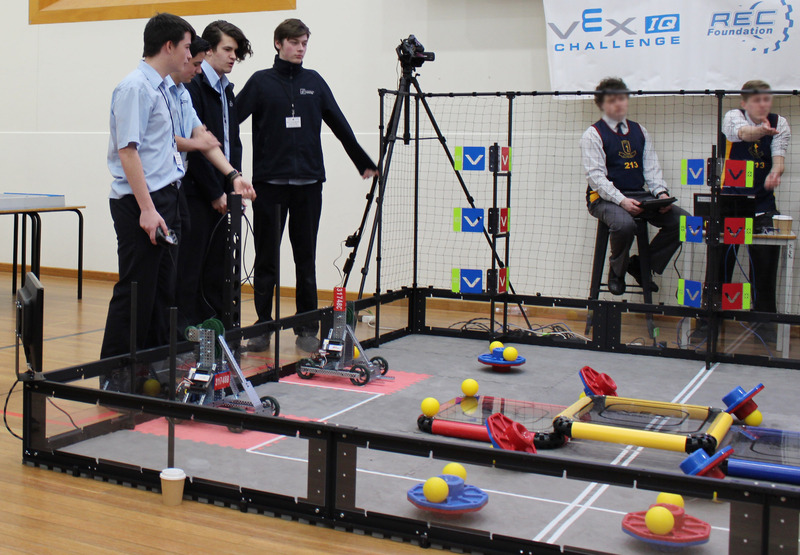 DXC Technology supported the students ahead of the last round of the Adelaide VEX Robotics competition, which they recently won. STEM teacher Brad Sheridan said DXC Technology were able to challenge the students with questions about their robots and also shared some general engineering principles. Northern Adelaide P-TECH Industry Liaison Officer Toni Hartley said the students were excited to welcome both Century Engineering and DXC Technology to their classrooms and learn directly from industry. “Making strong connections with industry is at the core of the P-TECH Australia program,’’ Ms Hartley said. “You could really see the students got a lot out of the visits and all our P-TECH partners should be applauded for the time and care they put into mentoring the next generation of workers. The Northern Adelaide P-Tech Australia partnership was recently listed as a finalist in the 2018 SA Training Awards for best Industry Collaboration. 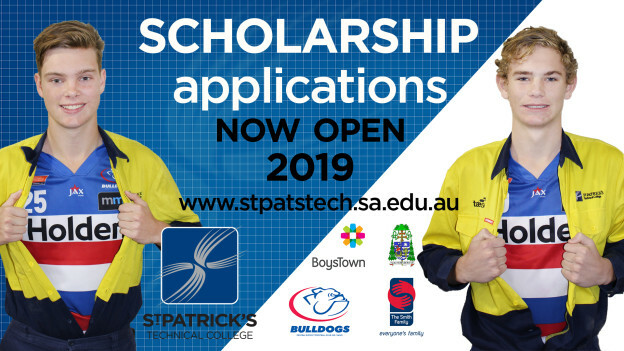 St Patrick’s Technical College scholarships are now open for 2019. Did you know that St Patrick’s Technical College has a number of scholarships to help students on their career pathway? Also eligible for financial assistance are students enrolled in The Smith Family Learning for Life program and assistance through BoysTown. Click HERE for our Scholarships information. 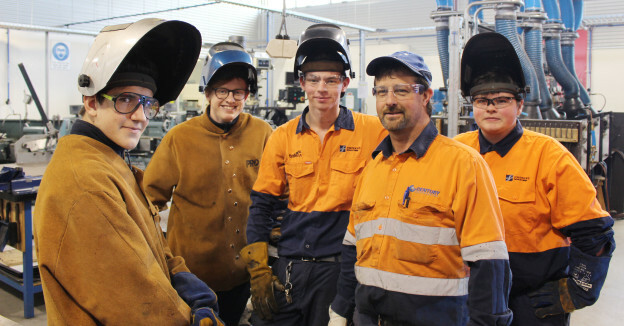 WITHOUT the help from The Smith Family Learning for Life program, seventeen-year-old Jack Felton may not have secured his first job as an apprentice for Les Brazier Mobility. Jack, from Davoren Park, was able to enrol in St Patrick’s Technical College’s Metals and Engineering course thanks to the Learning for Life program, which covered his tuition for Years 11 and 12. Jack with Principal Danny Deptula. He has recently started his apprenticeship in body repair technology with Les Brazier Mobility, which specialises in fitting out vehicles for people with physical disabilities. Even better, he was able to complete all the requirements for his SACE prior to beginning his apprenticeship so will spend the rest of his school year with his employer. StPatsTech offers a number of apprenticeship opportunities which are now open for applications. Earlier this year Central Districts Football Club awarded two scholarships for young players to attend StPatsTech. Normally the club only sponsors one scholarship, which covers two-thirds of the annual tuition fees, but Tyson Richard and Corey Smith were so impressive on and off the field they could not be split. Both young men are in the Construction program at the College. The College also offers an Employ SA Archbishop Scholarship which is a full scholarship covering the College’s tuition fee for the complete two-year program at St Patrick’s Technical College. 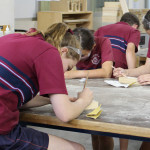 This entry was posted in Latest News, Media Releases on 18/09/2018 by St Patrick's Technical College. 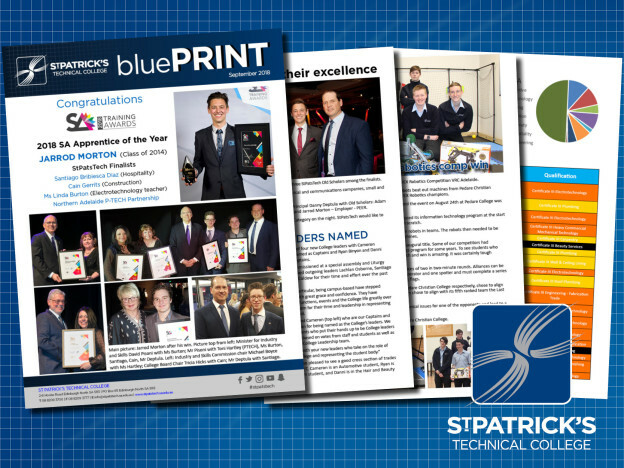 Find out what has been happening at StPatsTech over the past term. This entry was posted in BluePrint on 14/09/2018 by St Patrick's Technical College. 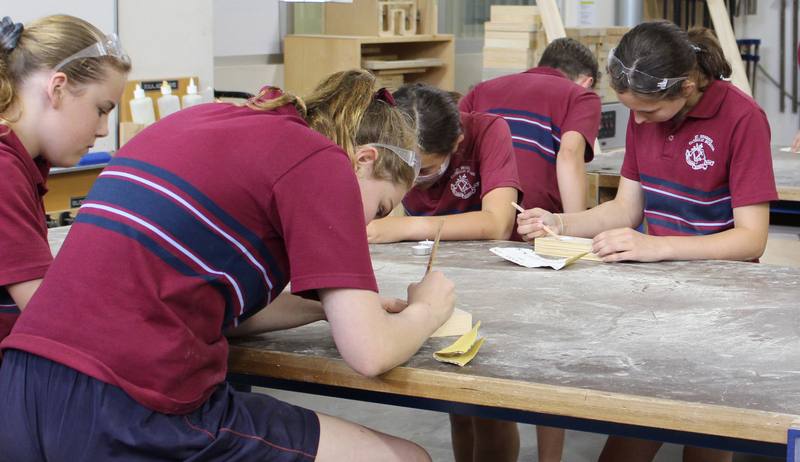 St Patrick’s Technical College has shared its fully immersive approach to vocational education and training with Catholic schools from around the country. This week Adelaide hosted the National Catholic VET and Vocational Learning gathering which has included conference days and site visits. Delegates heard from StPatsTech staff about the College’s P-TECH Australia program, which was recently named as a finalist in the SA Training Awards Industry Collaboration category. The presentation was followed by visits to the Rosewater Trade Training Centre and StPatsTech. 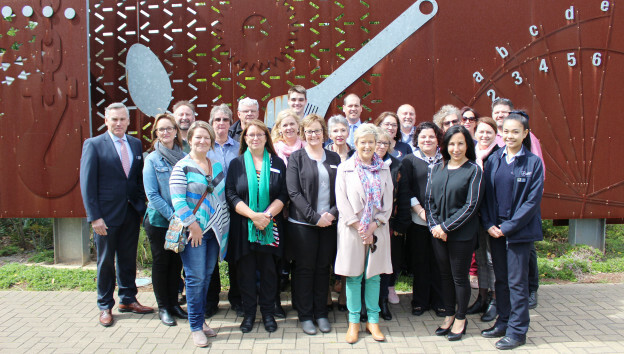 Delegates were treated to lunch prepared by the College’s Hospitality and Lifestyle students before undertaking a tour of the $15-million purpose-built trade training facilities. Jacqui Asser, Senior Education Adviser – Vocational Education, Catholic Education South Australia, said the delegates represented Catholic schools, diocese and training organisations from every state and territory in the country. StPatsTech Principal Danny Deptula said it was a great honour to have the delegates visit the College to learn more about our programs and outcomes. He said it was also good for StPatsTech to be part of the gathering this week to ensure they are up with best practice in vocational education. “By coming together and learning what does and does not work in delivering vocational education to the nation’s young people means we are all better educators,’’ he said. Some delegates will stay on in Adelaide to attend the National VET Conference at the Adelaide Convection Centre this week. StPatsTech will also be sending a number of staff members to take part in the conference. This entry was posted in Uncategorized on 12/09/2018 by St Patrick's Technical College.